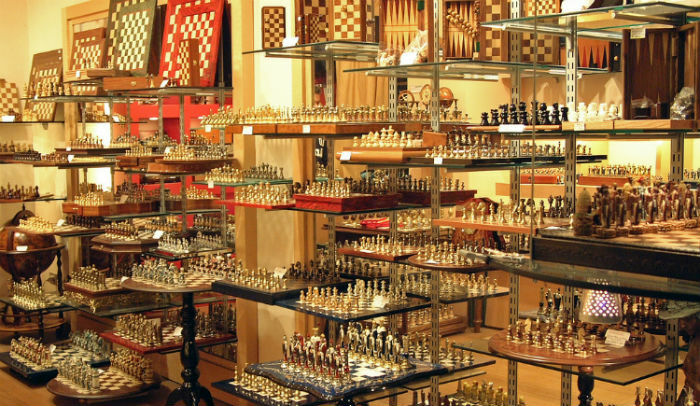 A user-friendly guide to the internet’s best chess stores. Whether you’re a beginner or an experienced collector, our advice can help you find the perfect set for a great price. Are you looking to buy a chess set, but have no idea where to begin? Maybe there are no chess stores near your location, or maybe you just feel more comfortable with online shopping – either way, we can help guide you to the best online chess stores in 2019 and make sure you avoid the worst ones. The House of Staunton is a well-respected brand with a wide variety of merchandise available in its online store. Many experts consider this brand the “gold standard” of chess products. With a quick scroll through their product list, it’s easy to see why. The House of Staunton produces beautiful, custom made and handcrafted sets that are either reproductions of historical sets, or a new take on an old favorite. Wooden chess sets, chess tables, chess boards, chess pieces, chess clocks, chess books, chess software, and more are all available in the House of Staunton store, so it could easily become a convenient one stop shop for all of your chess product needs. To learn more, check out our full review. Chess House is another great place where you can buy chess sets online. It began as a small mail-order shop based out of Kansas City, but has now grown into one of the top online chess stores in the world. They sell a wide variety of chess products, ranging from chess sets and tournament equipment to educational materials to step up your game. 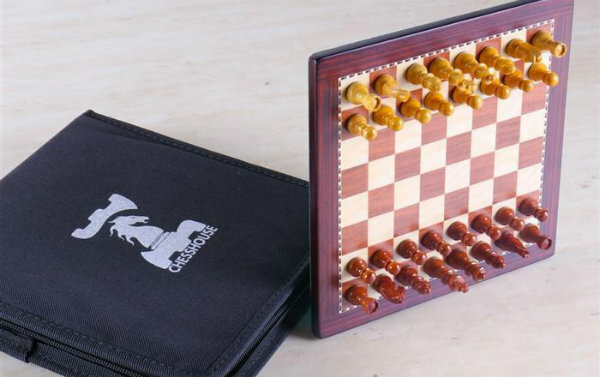 Their chess sets come in a much wider variety of styles and materials than the ones at The House of Staunton, so if you prefer a less traditional set, Chess House may have more products that suit your style. Chess House typically has great prices for all of its chess sets, and one of the most notable things about their store is how easy it is to source replacement parts for sets you bought from them. Even if years have gone by since you bought it, they’ll do their best to find you a suitable replacement piece. The Chess Store opened for business in 1999, and since then, it has been providing top of the line Staunton style chess sets for purchase. They take the quality of their products very seriously and only sell their own exclusive designs after each piece has been thoroughly inspected for quality. Though you won’t always find the cheapest price, you can get a great value when you buy your chess equipment from The Chess Store. ChessUSA is a giant in the chess equipment industry. It has a huge online store with over 3,000 unique items in stock, and it has been in business for over 35 years. Many people are raving about this online mega store, but is it really as good as they say? Does the real ChessUSA shopping experience live up to all the hype? Read our full review to find out if ChessUSA is the right online chess store for you! MegaChess is a specialty chess equipment store that deal exclusively in oversized chess sets. If you’re ever in the market for a giant chess set or outdoor chess set, MegaChess is the place to get it! They stock the widest variety of giant chess sets available on the market, as well as several other giant versions of favorite games. These will be a big hit at your next party! Chessbazaar is a relative newcomer in the chess equipment industry, but they have some unique and worthwhile features to offer. For one thing, they offer free shipping anywhere in the world, which is something that no other shop on this list currently offers. They also have an unbeatable low price guarantee. If you can find the same product being sold for a lower price anywhere else, Chessbazaar will beat that price by 10 percent! Wholesale Chess is a great place to get quality chess sets on a tight budget. They have a price match policy that ensures that their price on any product will never be beaten. This means that if you find the same item for a lower price anywhere on the web, they’ll lower their price to match. It’s a great feature and one of the things that makes Wholesale Chess the best place to shop if you want to stick to your budget. If you’re looking for the best place to learn chess or sharpen your skills, ChessCentral is the place for you. It sells an unparalleled range of high quality educational books, DVDs, and software that will up your game in no time. No matter what chess topic or strategy you’re interested in learning about, there’s bound to be something for you at ChessCentral, since they have such an incredible variety of products. You can also buy boards, pieces, and other chess accessories. Chess Boutique is a family owned online chess shop that has only been in business for a few years so far. Being so new to the industry, it hasn’t established much of a reputation, but that may change in due time. It does offer a wide selection of merchandise that is not available at other online chess retailers, but is it worthwhile to give this unproven company your business? Check out our review to find out! Based out of Poland, the Caissa Chess Shop offers a huge selection of high-quality chess products to European players. Its affordable prices, professionalism, and line of exclusive products make it a favorite for those in the know. For chess lovers based in Europe, buying from Caissa Chess Shop is a no-brainer. But can international shoppers take advantage of their good deals on great products? Read our full review to find out. The Official Staunton Chess Company prides themselves on two things – the quality of their products, and their commitment to excellent customer service. Of course, that’s easy to say, but is it just marketing buzz, or do they really stand behind those principles? Our in-depth review takes a close look at every aspect of their company to find out whether they’re worthy of your business, or just another mediocre online chess store. Read it here. ChessWarehouse is a new kind of chess shop for a new generation of chess players. This business may be one of the newest to arrive on the online chess store scene, but it’s here to stay. New customers are attracted to its high quality products at inexpensive prices every day, and we think it’s just a matter of time before this place explodes in popularity! Check out ChessWarehouse today for a chance to get in on the ground floor of an as of yet undiscovered diamond in the rough. House of Chess has been in business for over 30 years, have you heard of them? They’re the manufacturers of high quality chess sets that sell directly to consumers, no middleman required to get you the best deal! Click through to read our full review of House of Chess to find out what’s so great about them- and what’s not. Chess4Less differentiates itself from other online chess stores in that it focuses almost entirely on products that will make you a better chess player. Chess4Less pride themselves on having the largest online collection of books, DVDs and chess programs, so no matter what aspect of your game you’re looking to improve, you can be sure Chess4Less have a product for you. Chess4Less also stock boards and clocks from reputable brands such as DGT. Chess World is Melbourne’s oldest and only dedicated chess shop. In business for over 20 years, this Australian stalwart is committed to providing great quality chess equipment at a variety of price points. They are also big believers in the power of chess to create better people and, eventually, a better world. Check out our full review to see their company values, selection, quality, and much more! The Chess and Games Online Shop is a European based chess store that ships internationally. You will love its huge selection of quality products, particularly its DGT chess boards and handmade wooden chess sets! There’s something for everyone at the Chess and Games Online Shop. Whether it’s chess equipment, puzzle cubes, toys, brainteasers, or another game- if you want it, they’ve probably got it! American Chess Equipment is an online chess store unlike any other that we’ve reviewed so far. Its focus is not on the individual buyer looking to purchase one or two chess sets at a time. It actually caters to chess club and other organizations that need large quantities of chess equipment. Their special bulk pricing and quantity discounts make large orders more affordable, and their durable products mean you have to order replacements less often. We review the best chess shops from all over the web, but they can’t ALL be the best. This review takes an in depth look at Chess Baron and shows you how the average online chess shop differs from the top tier shops we recommend on this site. Chess Baron is a name you may have stumbled across in your search for chess equipment, but are they really a shop worth buying from? Read our full review to find out and see our recommendations. What Makes a Good Online Chess Store? Product quality is perhaps the most important factor to consider when judging an online chess store. If their products aren’t worth having, none of the rest of the factors really matter, except maybe the return policy. Make sure the store takes pride in their products and stands behind their quality. Not to be confused with low prices! Depending on the quality and luxuriousness of a product, a high price can still be a fair price. You’ll just want to make sure that the chess shop isn’t overcharging for subpar goods. You should get what you pay for. Finally, the quality of the customer service department says a lot about the store as a whole. If customer service is friendly, helpful, and eager to resolve your problem, that’s a sign of a good business.